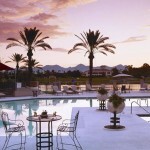 The McCormick Scottsdale is a boutique style golf resort located in the city center of Scottsdale. 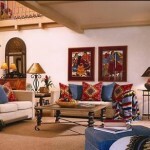 Relax in Southwestern-style guest rooms complete with private balcony or patio or upgrade your stay with a two or three bedroom villa; each designed with unique and individual décor. Each villa offers a full stocked kitchen, washer/dryer, separate living room and dining area along with a private balcony or patio. Dine in style at the award winning Pinion Grill; famous for its spirit of Southwest flare. 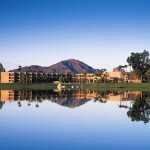 Enjoy charming views of Camelback Lake and McDowell Mountains from any seat in the house or dine lakeside with views of McCormick Ranch Golf Club. This 36-hole golf club resides across the lake from the resort. A complimentary shuttle will take you to and from the golf course. For those who like to relax, take a dip in the swimming pool complete with poolside snack bar or take a canoe on the lake. Also, for those seeking aerobic activity, on site is a fitness center complete with tennis courts. The McCormick Scottsdale does not feature a spa on-site; however, will offer to schedule appointments for guests at nearby facilities. 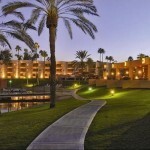 The resort sits next to numerous great Scottsdale restaurants and nightlife. Take the MCCLINTOCK DR exit, EXIT 8. Turn LEFT onto N MCCLINTOCK DR.
Stay STRAIGHT to go onto N HAYDEN RD. Turn SLIGHT LEFT onto E MCDONALD DR.